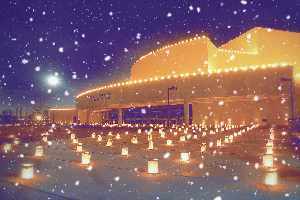 Enjoy a glistening beginning to the holiday season when San Juan College (SJC) provides its gift to the community with the 37th annual Luminarias display, Saturday, December 5. A glimmering array of luminarias will shine from rooftops, along sidewalks, in courtyards and select campus parking lots throughout the evening. The community can choose to drive or walk through. Walkers can begin enjoying the display at 5 p.m., while the driving route will open at 6 p.m.
Others will want to take advantage of the Park n’ Ride Red Apple Luminaria Trolley from Piedra Vista High School. The Trolley is free and will run from 6 to 8 p.m. No food or drinks will be allowed on the Trolleys. Only two entrances will be open during the event. Walkers may park in the Quality Center for Business, the School of Technology and Trades, the School of Energy and the north Child and Family Development Center lots, which are accessible by traveling south on College Boulevard from Pinon Hills Boulevard. Drivers will enter the college from Butler Avenue traveling north on Sunrise Parkway. They will then follow the marked route through the campus and exit at College Boulevard, where traffic will be required to turn south to 30th Street. Please note that the Pinon Hills Boulevard entrance to the college will be closed during the Luminaria display. As a courtesy, all drivers are asked to turn their lights off as they drive through the display. The sounds of the season will ring campus wide as San Juan College’s radio station KSJE 90.9-FM will broadcast Christmas carols. Walkers can warm up with a free cup of hot chocolate, provided by SJC Associated Students in the Sun’s Room. Weather permitting, the Planetarium will host its annual Star Gaze from 6 to 9:30 p.m., in the inner courtyard. A telescope will be set up to view the night sky. The Office of Student Activities coordinates the event with help from students, staff and community volunteers who set up and light the candles. Candle lighting begins at 3 p.m., on Saturday, Dec. 5, and volunteers can pick up their supplies in the Sun’s room at San Juan College. The week prior, hundreds of area school children help fill paper bags with sand and candles, which are then set out by the College students and staff. For further information about the event, contact the San Juan College Office of Student Activities at 566-3403.